The original vintage Star Wars action figures changed everything. With movable arms and legs and lots of accessories, yet inexpensive and mass distributed, toy history changed when Kenner released these 2 to 4 inch figures in 1978 after presales begain in 1977. Years later, ending in 1985, 115 standard figures were released with an incredible 10 million having been sold. Star Wars figures are sold even today, having been revived by the more recent films. 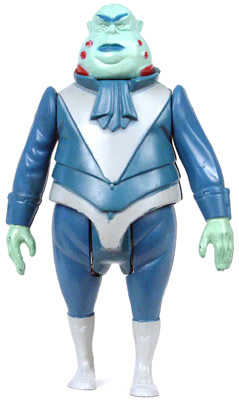 Thie page will focus on the original, vintage Kenner action figure lines. 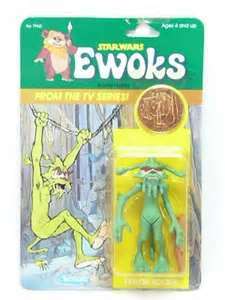 Droids Ewoks Cardbacks and Promotions Did You Know? 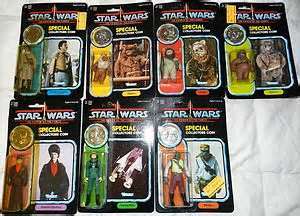 The first Star Wars figures were released in the Early Bird set that included Luke Skywalker, Princess Leia, Chewbacca and R2-D2. This set could only be obtained by mailing in the Early Bird certificate that came with the Star Wars Early Bird Certificate Package - a novel marketing idea necessitated by the fact that Kenner was still creating the toys kids who had been flocking to the movie were demanding. 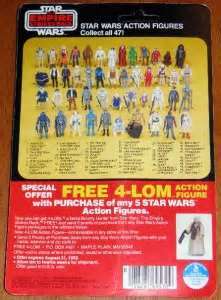 This package, sold mainly between July, 1977 and December 1977 (just in time for Christmas) included a display stand (no pegs), membership information, stickers and of course the beloved action figure redemption certificate. 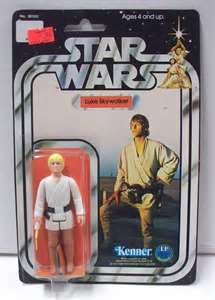 The earliest versions of these sets came with the "double-telescoping" Luke Skywalker while the later versions came with the standard telescoping Luke Skywalker (see more below). Artoo-Detoo (R2-D2) Variations: No known major variations. Accessories: None No known major variations. Ben (Obi-Wan) Kenobi Variations: Most common form is the white haired version but a fairly common variation is the grey haired version. 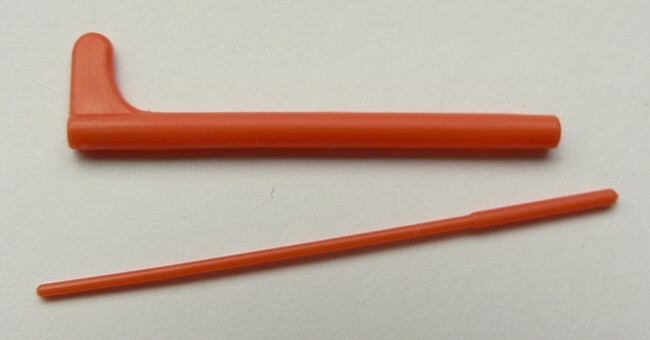 The most rare variation is clearly the "Double telescoping" variation sold very briefly which features a double-retractable lightsaber (like Luke and Darth). Accessories: The classic Ben Kenobi figure, came with a vinyl cape and retractable blue lightsaber. Chewbacca Variations: The only major variation is with regard to the weapon. The early bird version was dark green in color (also a few carded version were sold as well). Accessories: Bowcaster (unique to figure) No known major variations. Darth Vader Variations: The only major variation is the "Double telescoping" variation sold very briefly which features a double-retractable lightsaber (like Luke and Obi-Wan). Accessories: Darth came with a vinyl cape and retractable red lightsaber. (Star Destroyer Commander) Variations: No known major variations. Accessories: Black or dark blue stormtrooper blaster (shared by multiple figures) No known major variations. Han Solo Variations: Han was originally sold with a tiny head, but was then released with a larger head. Jawa Variations: The major variation is well known and is the original issue vinyl-caped jawa. This version was sold only for a short period when Lucas Films desired a more realistic cloth robe to look more like the jawas from the film. Luke Skywalker The classic star wars figure, Luke was initially released in the Early Bird mail-away set with a double-telescoping lightsaber (two-piece). This complex saber was quickly replaced with a one piece version, although some carded double-telecoping varients have been found. Variations: Major variations include "double-telescoping" light saber (extremely rare) and brown hair (uncommon). Princess Leia Organa Variations: No known major variations. Accessories: White vinyl cape and small black leia pistol (shared by multiple figures) No known major variations. (Sandpeople /Tusken Raider) Variations: No known major variations. Accessories: Dark brown gaffi stick (unique to figure) No known major variations. 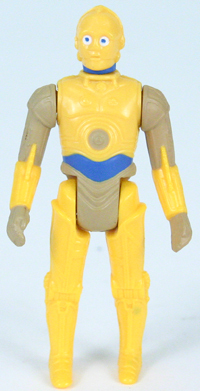 See-Threepio (C-3PO) Variations: No known major variations. Stormtrooper Variations: No known major variations. Greedo Variations: No known major variations. Accessories: Black or dark blue stormtrooper blaster (shared by multiple figures) or black or dark blue "han solo" pistol (also shared by multiple figures) No known major variations. Hammerhead Variations: No known major variations. Variations: No known major variations. 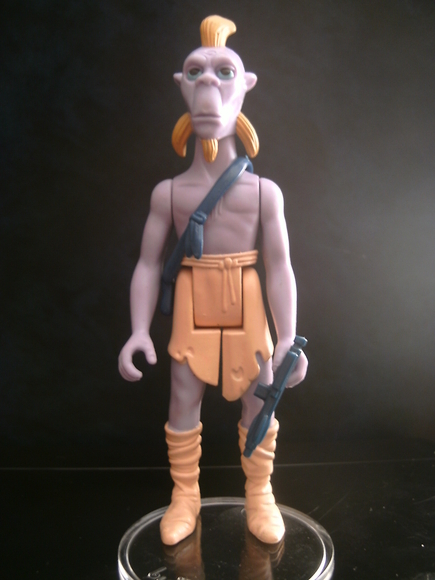 Blue Snaggletooth Made prior to the movie release and included in the Sears exlcusive cantina adventure set, Lucasfilms soon realized the error and modified the figure into the short version (above). Boba Fett Although he never appeared in the original Star Wars movie, Boba Fett was released on a Star Wars backer card. This is the most valuable carded Boba Fett figure. Variations: No known major variations for the standard figure although numerous minor paint variation exist. The "rocket-firing" Boba Fett is not a variation but a different figure and was only released as a prototype. The most recent recorded sale of the rocket-firing figure was $17,000 in 2011. Walrus Man Variations: No known major variations. Arfive-Defour (R5-D4) Variations: No known major variations. Death Star Droid Variations: No known major variations. (X-Wing Fighter Pilot) Variations: No known major variations. Accessories: Black or dark blue "han solo" pistol (shared by multiple figures) No known major variations. Power Droid Variations: No known major variations. Accessories: None (although the rubber gasket on top can be removed...and lost) No known major variations. Bossk (Bounty Hunter) Variations: No known major variations. Accessories: Dark blue rifle (unique to figure) No known major variations. Variations: Two main variations - leg position (closed or open) and mustache (standard or fu man chu). Bespin Security Guard (Black) Variations: No known major variations. Accessories: Dark blue bespin pistol (shared by multiple figures) No known major variations. FX-7 (Medical Droid) Variations: No known major variations although a minor variation with regard to location of eyes has been reported. 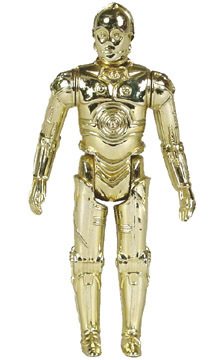 C-3PO (Removable Limbs) Variations: No known major variations. Accessories: Black "chewy pouch" (unique to figure). Allows you to atach a dissasembled C-3PO to Chewy. No known major variations. (Hoth Outfit/Battle Gear) Variations: No known major variations. IG-88 (Bounty Hunter) Variations: One major variation exists - the common version is silver while the less common variation is dull grey. Accessories: Two weapons - a black stormtrooper blaster (shared by multiple figures) and long blaster rifle (unique to figure) No known major variations. Snowtrooper Variations: One major variation exists - the eyes are either connected or seperated. Accessories: Long blaster rifle (shared by Dengar) No known major variations. Lando Calrissian Variations: One major variation exists - common version shows no teeth, the less common version shows teeth. Tie Fighter Pilot Variations: No known major variations. Accessories: Grey pistol (same as Cloud Car Pilot) No known major variations. (Bespin Fatigues) Variations: Common form has yellow hair but a brownish colored haired figure exists as well. 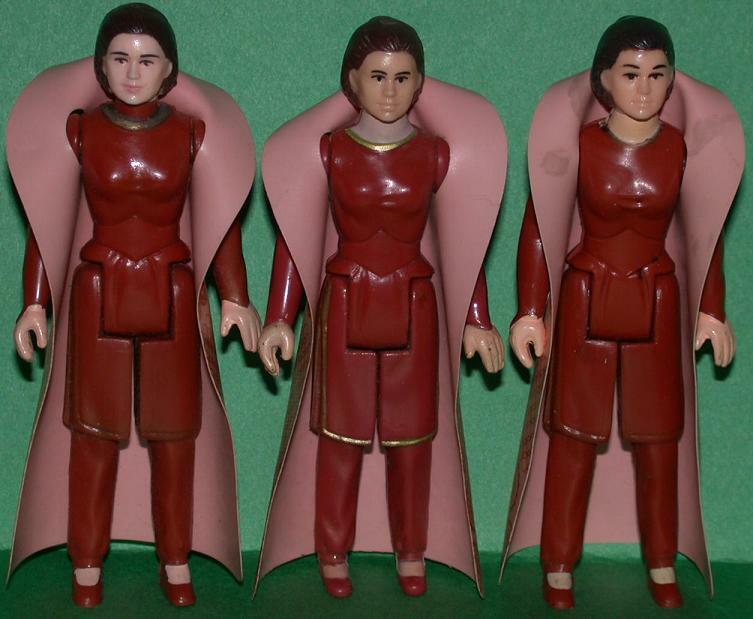 (Bespin Gown) Variations: Variations exist with regard to the collar of her shirt (either turtleneck or plain) and hair color (brown or black). (Hoth Battle Gear) Variations: No known major variations. Accessories: Black laser rifle (same as Rebel Commander) No known major variations. (Bespin/Cloud City Outfit) Variations: No known major variations. Accessories: Dark blue bespin pistol (shared by hoth stormtrooper) No known major variations. Lobot Variations: No known major variations. Accessories: Black or dark blue bespin pistol (shared by hoth stormtrooper) No known major variations. Dengar Variations: No known major variations. Accessories: Black long imperial rifle (shared by hoth stormtrooper) No known major variations. Yoda Variations: Most common version has an orange snake. More rare is the brown snake variation. The cane also came in a light and a dark brown color. R2-D2 (Sensorscope) Variations: No known major variations. AT-AT Driver Variations: No known major variations. Accessories: Black Imperial rifle (unique to figure) No known major variations. (Hoth Outfit) Variations: No known major variations. Accessories: Black leia pistol (shared by multiple figures) No known major variations. Imperial Commander Variations: No known major variations although a variation in paint shine (glossy vs matte) has been reported. Accessories: Black stormtrooper rifle(shared by multiple figures) No known major variations. Rebel Commander Variations: No known major variations. 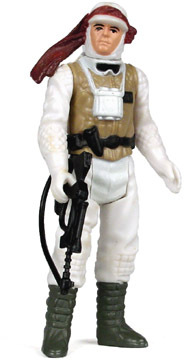 Accessories: Black hoth rifle (shared by multiple figures) No known major variations. 2-1B/ Two-Onebee (2-1B) Variations: No known major variations. Accessories: Silver breathing tube and medical tool (unique to figure) No known major variations. General Veers Variations: No known major variations. Accessories: Blue bespin pistol (shared by multiple figures) No known major variations. 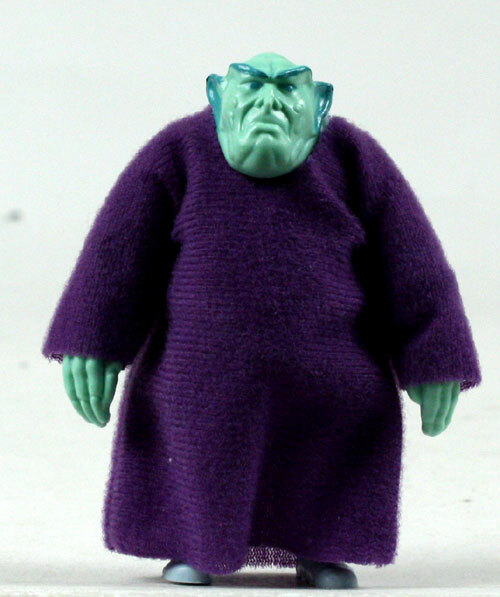 Ugnaught Variations: The smock color is either blue (common), purple (less common) or green (very rare). Accessories: Smock and suitcase (unique to figure) No known major variations. Cloud Car Pilot Variations: No known major variations. Accessories: Grey pistol and communicator (unique to figure) No known major variations. 4-LOM Variations: No known major variations. Accessories: Black blaster (unique to figure) No known major variations. Zuckuss Variations: No known major variations. Accessories: Gold blaster (unique to figure) No known major variations. Admiral Ackbar Variations: Although no major variations exist, there is a minor color variation for his vest - either grey-colored (common) or cream-colored (less common). Accessories: Black staff (unique to figure) No known major variations. 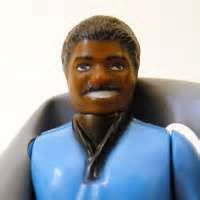 Lando Calrissian (Skiff Guard Disguise) Variations: No known major variations. Accessories: Grey skiff staff (shared by multiple figures) and brown helmet. No known major variations. The Emperor Variations: Two minor variations exist although they only differ slightly. One has more detailed hands and a less detailed robe. The other has less detailed hands and a more detailed robe. Accessories: Black cane (unique to figure) No known major variations. Nien Nunb Variations: No known major variations. Accessories: Black pistol (unique to figure) No known major variations. General Madine Variations: No known major variations. Accessories: White staff (unique to figure) No known major variations. Emperor's Royal Guard Variations: No known major variations. Accessories: Grey long staff (unique to figure) No known major variations. 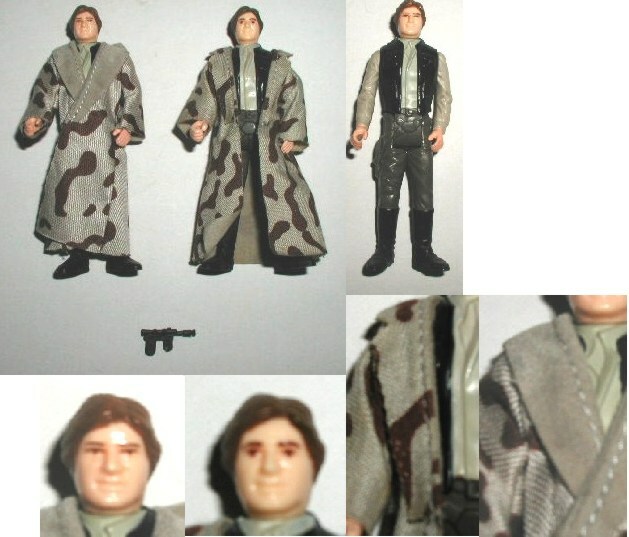 Han Solo (Trench Coat) Variations: One major variations exists - the lapel of coat, one version is camouflaged, the other is plain. There are also slight differences in his face paint and hair color. Rancor Keeper Variations: No known major variations. Accessories: Grey gaffi stick (identical to Tusken Raider except for color) No known major variations. Bib Fortuna Variations: One known major variation. A very rare red robe version was released for a short period of time. Accessories: Brown staff (unique to figure), robe and inner armor piece. Teebo Variations: No known major variations. Accessories: Tan headgear, staff and horn. All unique to figure. No known major variations. Wicket Variations: No known major variations. Accessories: Brown hood and staff. All unique to figure. No known major variations. Chief Chirpa Variations: No known major variations. Logray (Ewok Medicine Man) Variations: No known major variations. Accessories: Black and white headgear, staff and bag. All unique to figure. No known major variations. Paploo Variations: No known major variations. Accessories: Brown staff and tan hood. All unique to figure. No known major variations. Lumat Variations: No known major variations. Accessories: Brown hood, brown quiver of arrows and brown bow (brown hood is unique to figure, bow and quiver are shared by Lumat). No known major variations. Nikto Variations: No known major variations. 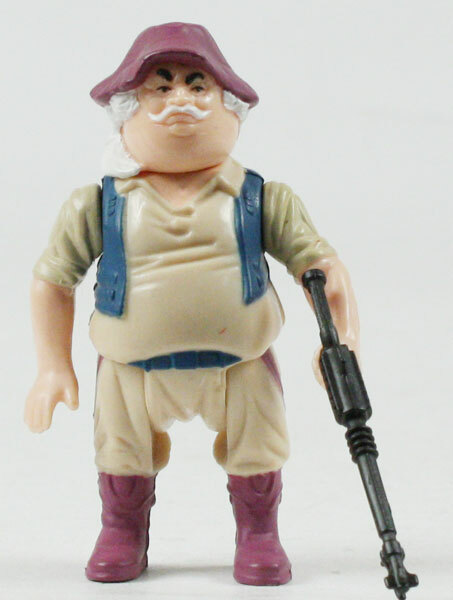 Accessories: Grey skiff rifle staff (shared by multiple figures) No known major variations. Klaatu (In Skiff Guard Outfit) Variations: No known major variations. Accessories: Grey skiff long rifle (unique to figure) figures) No known major variations. Klaatu Yes, for some reason they made two Klaatu figures. Why did this guy deserve this treatment? We may never know. Accessories: Grey skiff staff (shared by multiple figures) No known major variations. 8D8 Variations: No known major variations. Squid Head Variations: No known major variations. Accessories: Brown outer robe, grey armor piece and grey bespin gun (unique to figure) No known major variations. Ree-Yees Variations: No known major variations. Weequay Variations: No known major variations. Rebel Commando Variations: No known major variations. Accessories: Green rifle (unique to figure) No known major variations. (Boushh Disguise) Variations: No known major variations. Accessories: Super long rifle and helmet (unique to figure) No known major variations. (Jedi Knight Outfit) Variations: Three major variations. First is in color of saber, blue is common, green is more rare. The robe also came in two material types, a thin, more common material, and the second being a more thick fluffy material. Lastly, the robe either has a snap or is sewn together in front. Gamorrean Guard Variations: One major variation exists - the armor is either silvery metallic or a darker color. Accessories: Axe (unique to figure) No known major variations. Princess Leia (Battle Poncho) Variations: No known major variations. Accessories: Poncho, helmet and tiny blaster pistol (shared by multiple figures) No known major variations. Biker Scout Variations: One major variation exists - one helmet version has a long black mouthpiece, the other is smaller and has a white bar under the black mouth opening. Prune Face Variations: No known major variations. Accessories: Robe and rifle (unique to figure) No known major variations. AT-ST Driver Variations: No known major variations. 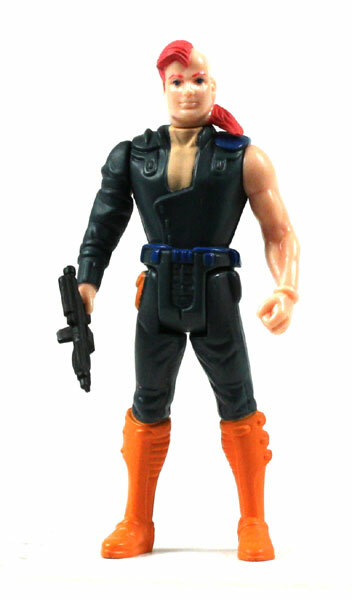 Accessories: Tiny black pistol (shared by multiple figures) No known major variations. B-Wing Pilot Variations: No known major variations. 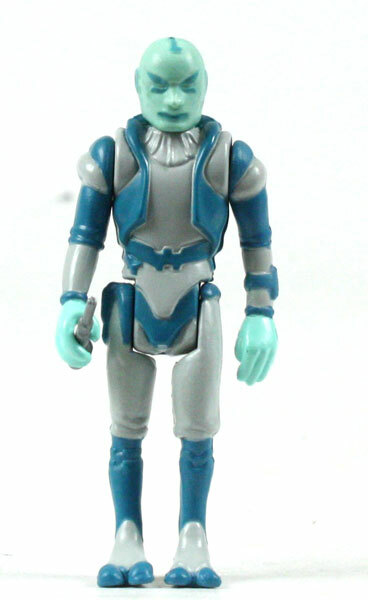 Accessories: Tiny blue pistol (shared by multiple figures) No known major variations. 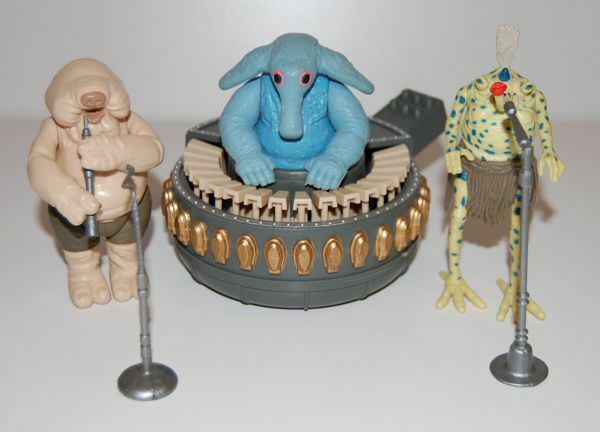 Sy Snootles, Max Rebo and Droopy McCool Including in the action figures section although they are not listed on any cardbacks and people usually list them with playsets. They came in a boxed set, sold heavily from 1983 to 1985. Accessories: Two microphones, a flute and keyboards. Amanaman Variations: No known major variations. 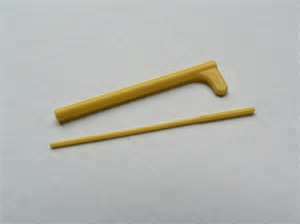 Accessories: Large rubber staff (unique to figure) No known major variations. Anakin Skywalker Although not sold in the US, Anakin Skywalker is a pretty common mail-away figure. Imperial Gunner One of my favorite all-time action figures. Usually packed with a black weapon but some carded examples with a blue/gray weapon have been found. Accessories: Black tiny pistol (shared by multiple figures) No known major variations. Imperial Dignitary One of my least favorite all-time action figures. Warok Variations: No known major variations. Accessories: Brown hood, quiver and bow (shared with Lumat) No known major variations. (with pop-up lightsaber) Variations: No known major variations. Accessories: Green lightsaber (pops out and commonly missing) No known major variations. Romba Variations: No known major variations. Accessories: Brown hood and spear (unique to figure) No known major variations. (Stormtrooper disguise) Variations: No known major variations. Accessories: Black stormtrooper blaster and helmet (unique to figure) No known major variations. (Combat Pancho) Variations: No known major variations. Accessories: Poncho and black blaster (shared with Lando General) No known major variations. (Carbonite Chamber) Variations: No known major variations. Accessories: Carbonite block (unique to figure) No known major variations. EV-9D9 This mean little droid torturer from the Return of the Jedi got an action figure, complete with movable jaw that is operated by a little lever behind the head. The only figure with such a feature and also comes with legs that tend to warp (bend in) over time. (General Pilot) Variations: No known major variations. Accessories: Cape and black blaster (shared with Luke Battle Pancho) No known major variations. Yak Face Variations: No known major variations. Barada No clue why Klaatu got two figures and it took an ill-fated extended figure line to get Barada a figure. A-Wing Pilot Variations: No known major variations. Accessories: Black or blue/grey small pistol (shared by multiple figures) No known major variations. 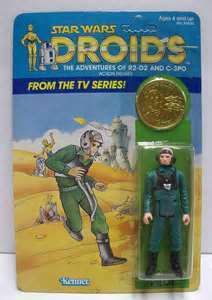 The Droids series figures were sold with a gold coin (except for Vlix). Artoo-Detoo (R2-D2) An interesting remake of R2-D2 featuring a whole new dome sculpt. A-Wing Pilot Identical to the Power of the Force figure. Boba Fett Variations: No known major variations although minor paint variations exist. Jann Tosh Variations: No known major variations. Jord Dusat Variations: No known major variations. Kea Moll Variations: No known major variations. Kez-Iban Variations: No known major variations. Sise Fromm Variations: No known major variations. Thall Joben Variations: No known major variations. Tig Fromm Variations: No known major variations. Uncle Gundy Variations: No known major variations. Vlix The rarest of Droids figures (likely due to his lack of allure and the fact that he was released only in Brazil by Glasslite). He is also the only figure released without a coin. No known variations exist. 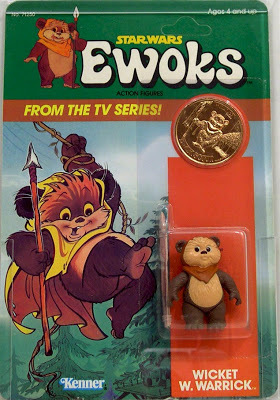 The Ewoks series figures were sold with a gold coin. Dulok Scout Variations: No known major variations. Dulok Shaman Variations: No known major variations. King Gorneesh Variations: No known major variations. Logray Variations: No known major variations. Ugrah Lady Gorneesh Variations: No known major variations. Wicket W. Warrick This little guy came with a spear and is very difficult to find complete. 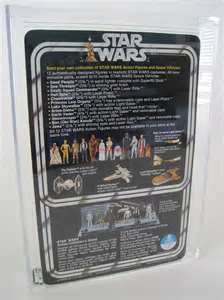 The majority of vintage Star Wars figures came packaged on a 6" x 9" card with a bubble or blister attached and the figure inside. The backer cards went through many changes in the line's eight-year history creating many variations. The most often used terminology for labeling these different cards stems from the number of action figures pictured on the back. Thus a 20-back has 20 figures pictured on the back of the card. A letter system is also used to designate the logo on the card. A 65-ROTJ back, then, would be a card with 65 figures on the back and the Return of the Jedi logo on the front. Probably the most popular with collectors, the �twelve backs� are highly valued because they were the first figures released (and thus command higher prices). It is interesting to note that there are instructions on the 12-backs for using the telescoping lightsaber feature that was originally planned for Luke, Ben, and Darth. The saber feature was modified (to a more simple pull-out feature), but the text still made it onto the packaging. 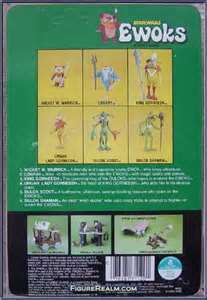 Star Wars cards were also released with 20 backs which showed the first two set of figures and then on 21-backs which included the Boba Fett figure. The last Star Wars header card was actually a 32-back. This seems odd looking at the fact that ESB cards started with 21-backs before moving on to 31- and 32-backs. This SW card, however, is simply a 12-back with a sticker slapped over the bottom half showing the next twenty figures e. A likely reason for this oddity is that Kenner started releasing ESB 31-backs and had some SW 12-backs left over. They wanted to update the card to let people know about the new figures, so they printed up a sticker showing the new figures. 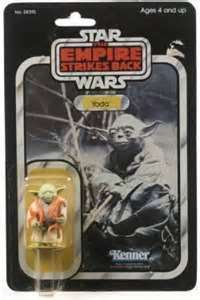 These were probably released just after the ESB 31-backs and before the 32-backs came out. These SW 32-backs are fairly difficult to find and could command a price of up to 40% more than book to a buyer interested in such variations. The first ESB cards were the 21-backs. These are basically the same card at the SW 21-backs with the logo updated for the Empire Strikes Back. These cards are some of the hardest to find and often get prices up to 50% over book. Of all the card variations, the ESB 21-back is probably one of the most sought after even though it may not be the rarest. The Empire headers had a long life, proceeding from the 21-backs to 31-, 32-, 41-, 45-, 47-, and 48-backs. As new figures were added to the line, they were put on the card backs. Many of these cards also had variations on the toys and playsets shown at the bottom of the card. ROTJ cards had four card backs starting with a 48-back and proceeding through 65-, 77-, and 79-backs. The 48-back is the tough find of the bunch because it was a transition card like the ESB 21-backs. Kenner was moving all the figures onto ROTJ packaging and this card had the short run before being updated with ROTJ figures on the back. It is interesting to note that the 65A back has two figures blacked out on the card. These are both Ewoks. The reasoning behind this is that these cards were released before the movie Return of the Jedi was actually in theaters. 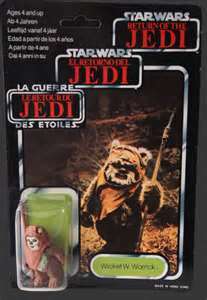 George Lucas wanted to keep the Ewoks a secret, so he insisted that Kenner not reveal them. There was only one card back for this series of figures, the 92A. Figures that come on this card are often the mostly highly priced, even if the figure had been released on an earlier card. This is due to the fact that many less were released and that the nifty packaging which included a collector's coin is usually more sought after by collectors than other carded figures. These two cards had scenes from the cartoons on the fronts and pictures of the Droids and Ewoks toys on the backs and no widely produced variations exist for the cards. Trilogos were identical to ROTJ and POTF cards with the exception of the trilingual packaging. Figures packaged on Trilogo cards bring a much smaller price than the same figure on another card back. Most of the Trilogo card backs are the same as their U.S. counterparts, but there are a few differences. There is, for example, a 79-back Trilogo card with the Ewoks blacked out in the same manner as the 65A card. This back does not appear on the U.S. packaging. 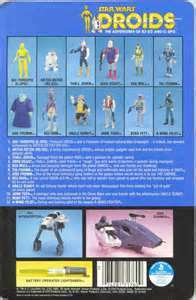 There were many other foreign packaged items by Kenner affiliates in Europe, Asia and South America including Takara (Japan), Meccano (Mexico), and Palitoy (England). Some of these packages are very similar to their North American cousins and some are radically different. 1. Action Figure Collector's Stand: This offer appeared only on 12-backs and came with two variations, one offering the stand for 2 Proofs of Purchases and $2.00 and the other adding that it could be received free for 12 Proofs of Purchase. 2. 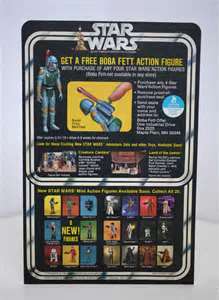 Free Boba Fett: This promotion was for the infamous Rocket Firing Boba Fett, none of which were ever actually shipped. The offer has several different appearances with later cards having a sticker slapped over the part of the card touting the Fett with a firing rocket. There are also several expiration extensions which appear as stickers on earlier cards with the offer. 3. Free Secret Star Wars Figure: This offer appeared on several cards extending from Star Wars and into the Empire Strikes Back era. The latest ESB card with the offer revealed that the secret figure was Bossk. 4. Action Figure Survival Kit: This package had several items to be used as accessories to the action figures. The offer ran only on the ESB 41-backs. 5. Star Wars Display Arena: Running on ESB 45-backs, this promotion only had one variation, an extension of the deadline. 6. Free 4-LOM: This offer only ran on one card, the ESB 47 back. 7. Free Admiral Ackbar Figure: This offer was touted as a Revenge of the Jedi offer, the name of the third movie before George Lucas decided to change it into Return of the Jedi. 8. Free Nien Nunb Figure: This offer was only on ROTJ 48 backs. 9. Free Emperor Figure: This offer only ran on the 65D card backs. 10. 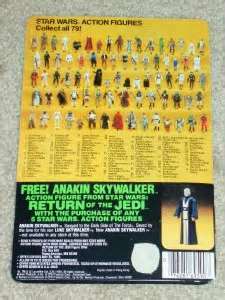 Free Anakin Skywalker Figure: This offer was on card backs from 65-backs through the end of ROTJ 79-backs. Kenner made one glaring mistake in the line but we didn't realize it until after the fact. Somehow, the names on the cardbacks for two of the bounty hunters of the ESB line were switched. Probably for consistency's sake, the mistake remained through the ROTJ series. To collectors, 4-LOM will always be Zuckuss, and Zuckuss will always be 4-LOM. Now to set the record straight, 4-LOM is the droid looking one and Zuckuss in the insectoid creature with the beige robe. As far as I have been able to determine, when referencing the loose figures it is acceptable to use both names, but for the carded figures the naming mistake is maintained so that the reference matches the name on the figure.